The Ulysses Project (“the Project” or “Ulysses”) is centred about 30km south of Leonora and 200km north of Kalgoorlie in Western Australia. 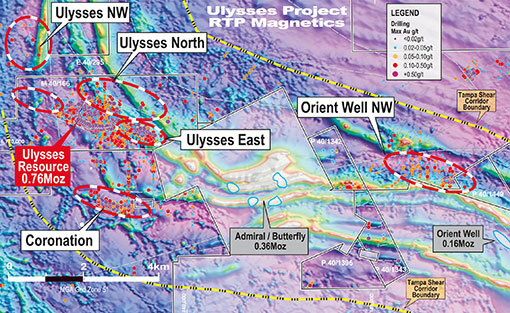 Ulysses is located in the minerals rich and highly prospective Eastern Goldfields of Western Australia. It is located 30km south of the Sons of Gwalia (6Moz of Production and 1.8Moz Reserve) mine and along strike of Orient Well and Kookynie mine camps which have produced over 0.7Moz (see Figure 1). It is close to world leading mining infrastructure which will potentially allow toll treatment of ore from Ulysses. 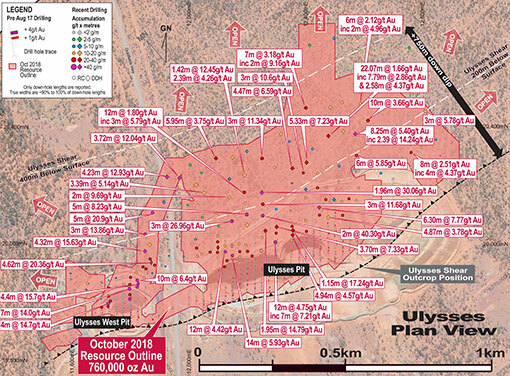 The Ulysses Deposit was mined by Sons of Gwalia in 2002 producing 266,358 t @ 2.92 g/t Au for 24,985 Oz Au. Ore was treated at the Gwalia Treatment plant. Genesis acquired Ulysses in 2015 and following exploration success, the Company completed two open pit mining campaigns at the Ulysses West Pit in 2016 and 2017. Ore from Ulysses West was processed under a toll treatment arrangement at the Paddington Mill located 160km south of Ulysses along the Goldfields Highway. 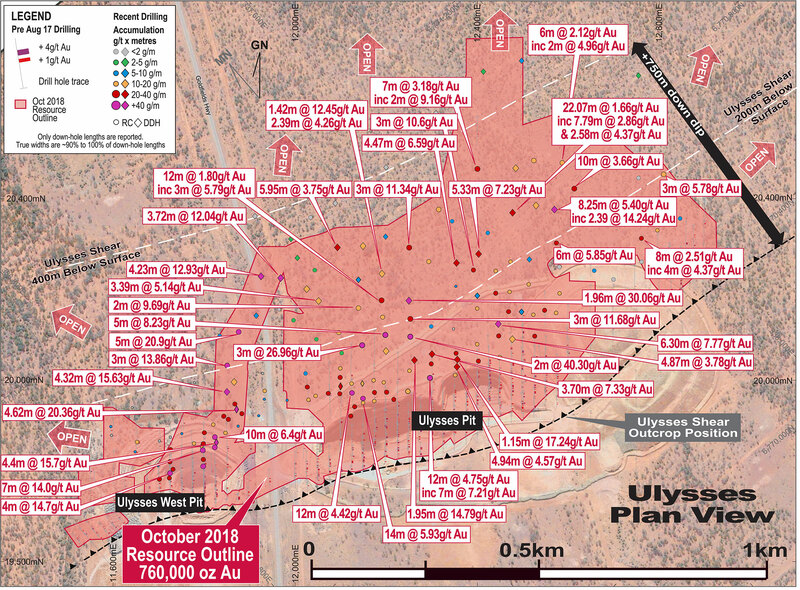 Ulysses is a large scale gold system with an aggressive drilling program underway which increased the Mineral Resource by 137% (439,000oz Au) in 2018 at <$10/oz. Genesis is targeting the development of a long-life, standalone underground mining operation at Ulysses with Feasibility work ongoing following the completion of a Scoping Study in late 2018. Recent shallow drilling results from Ulysses East and Orient Well NW has highlighted the potential to establish open pit resources outside of the existing Resource. The broader Ulysses Project remains under-explored (see Figure 2). Figure 3. Ulysses Mineral Resource (moderate red outline) with the high-grade portion of the resource showing in magenta. The Resource estimate extends for over 2,000m. Ongoing drilling below the existing Ulysses and Ulysses West open pits has been very successful in identifying a number of high-grade gold zones (shoots). These shoots are visually identifiable in drill chips and core and have been separately modelled and estimated to quantify the higher-grade shoots within the overall Mineral Resource estimate. These high-grade gold shoots have significant plunge extents and, importantly, are all open at depth. Extensional drilling has shown that mineralisation extends to ~500m below surface, over 750m down-dip of the Ulysses pit (see Figure 3). Figure 4. Plan view of the location of the Ulysses Mineral Resource projected to surface. The Mineral Resource outline is shown in red. The Mineral Resource extends for over 2km of strike and sits immediately below and along strike of the Ulysses Open Pits (see Figure 4). 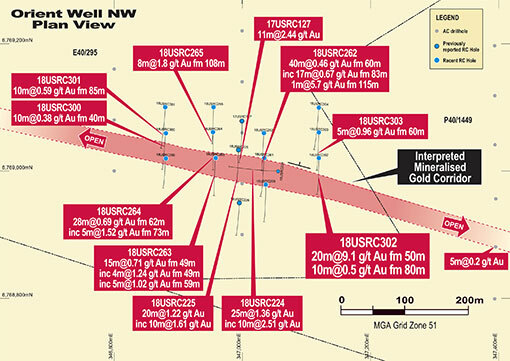 The Resource envelope currently extends to ~500m below surface at its deepest point and is estimated to an average depth of ~320m below surface, with a gold endowment of +2,400 ounces per vertical metre (ovm) for the 260m interval from the 360mRL (base of the open pits) to the 100mRL (interval of highest drill density). Drilling programs are ongoing at Ulysses with the objective to grow the Mineral Resource along strike to the east and west as well as down-plunge. 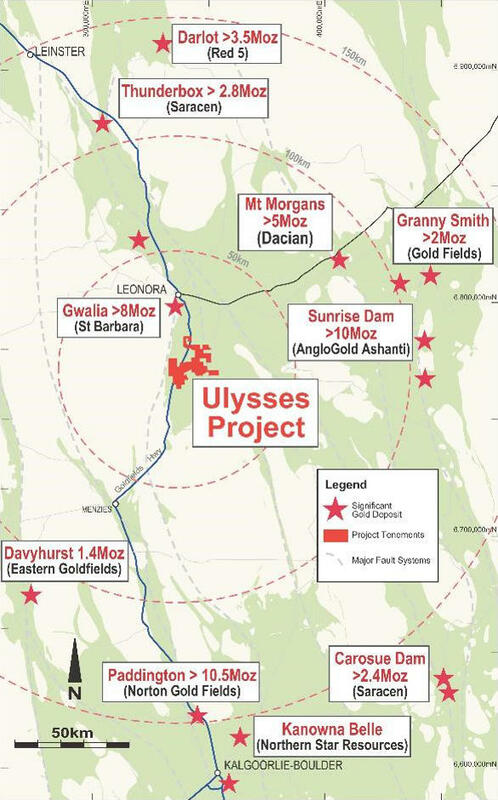 Work on a Feasibility Study is underway on the Mineral Resource with a view to making a decision on developing a long-term underground gold mine at Ulysses by the end of calendar year 2019. Ulysses has a Measured, Indicated and Inferred Mineral Resource of 7.1Mt @ 3.3 g/t gold for 760,000 ounces of contained gold. The high-grade portion of the Mineral Resource, reported at a cut off of 2g/t gold which will form part of the mining evaluation for the Feasibility Study is estimated to contain 4.1Mt @ 4.7g/t gold for 628,000 ounces. The high-grade shoots which form part of the overall Mineral Resource are estimated to contain 1.6Mt @ 6.9g/t gold for 356,000 ounces. A summary of the 2018 Ulysses Mineral Resource is shown in Table 1. Note: Rounding differences may occur. Full details of the Mineral Resource estimate are provided in the Company’s ASX Announcement dated 9 October, 2018. 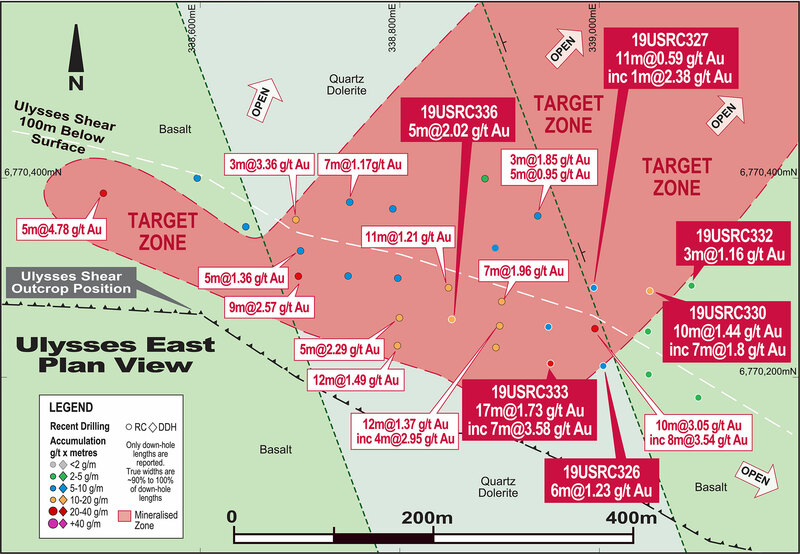 Genesis completed a positive Scoping Study in November 2018 which outlined the potential to develop a standalone gold operation at Ulysses. The Scoping Study contemplated the development of an underground mining operation with the construction of a stand-alone 0.8 million tonne per annum (Mtpa) ore processing facility and the results to date clearly demonstrate a project which is financially robust and has strong project fundamentals and low technical risk. The positive Scoping Study provides the Company with confidence to advance the project through a detailed Feasibility Study while maintaining an aggressive approach to drilling to grow the Ulysses Mineral Resource and target potential new discoveries. The Resources in the proposed Life-of-Mine (LOM) production schedule extracted from the total Mineral Resource of 7.1Mt @ 3.3g/t gold for 760,000oz are ~3.01Mt @ 4.1g/t gold for 400,000oz fully-diluted. A production rate of approximately 0.8Mtpa to 0.9Mtpa is considered the optimum development scenario for the Project and produced the best capital and operating efficiencies. Gold production based on the proposed LOM production schedule is forecast at ~357,000oz recovered over 4 years. AISC costs (LOM) are forecast in the range of A$1,000/oz to A$1,100/oz. Full details of the Scoping Study results are provided in the Company’s ASX Announcement dated 23 November 2018. 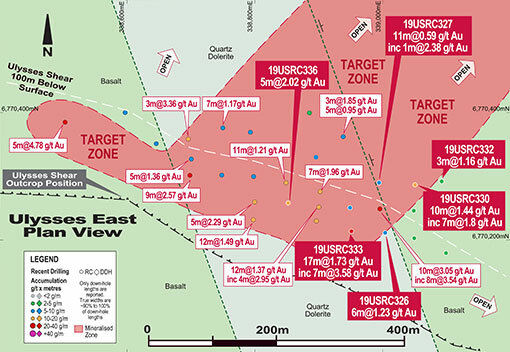 Drilling by Genesis has intersected significant mineralisation at the Ulysses East prospect (see Figure 5), located at the eastern end of the 760,000oz Au Ulysses Mineral Resource, highlighting the potential to delineate a significant zone of shallow mineralisation in this area which is potentially amenable to initial extraction via open pit methods. 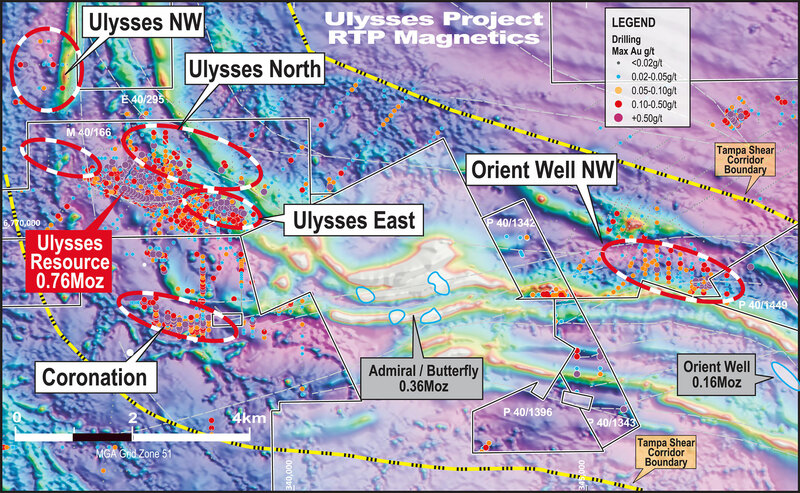 Drilling at Ulysses East has defined extensive oxide and primary mineralisation over 600m of strike. Recent drilling has focused on the upper quartz dolerite unit and where it is cut by the Ulysses Shear. The intersection of the magnetic quartz dolerite unit and the Ulysses Shear occurs over 400m and plunges shallowly to moderately to the north-east (shown in Plan View in Figure 6). Drilling by Genesis has intersected significant shallow oxide mineralisation at the Orient Well NW prospect (see Figures 2 & 7), located 10km east of the 760,000oz Au Ulysses Mineral Resource. Drilling at Orient Well NW returned a best result of 20m @ 9.10g/t gold and a number of wide zones of lower grade mineralisation including 5m @ 1.52g/t gold within a broader zone of 28m @ 0.69g/t gold and 8m @ 1.80g/t gold. Drilling has highlighted 1.5km of highly prospective strike which will be systematically tested for potential open pittable Mineral Resources in the first half of 2019. This mineralised strike remains open. The drilling results have significantly increased the Company’s confidence in the emerging oxide opportunity at Orient Well NW, which is the first satellite prospect to be drilled outside of the existing Resource – which has been the main focus of drilling to date. Genesis has completed wide-spaced aircore drilling at several new areas including Ulysses North, located immediately north of the Ulysses Resource, and Ulysses NW, located ~4km north-west of the Ulysses Resource. Drilling has successfully intersected mineralised zones (see Figure 2).